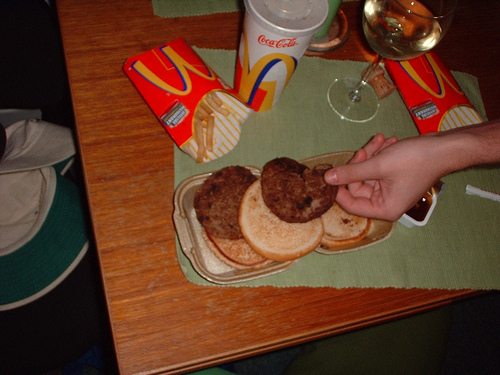 “Two all beef patties,” – just barely. Remember that little old lady that asked “Where’s the beef?” She was looking at this picture I took. “special sauce,” – not in either picture, so no big deal. “cheese,” – looks exactly the same as the picture! That is just terrible. What is Gary doing drinking white wine with a Big Mac? Everybody knows you need a full-bodied red to sufficiently complement the special sauce. This post is filed under Big Mac, Fast Food, McDonald's, Sandwich. PS at fast food places, never buy the french fries, remember potatoes are one of the cheapest food on the planet, back when the country went into a depression and many people lost their homes and couldn’t even afford food. the most common thing they actually made enough money to afford was potatoes because you get a lot of grams out of a little bit of money. when you spend $1 for a small fries, your basically getting like 1/10th of a potato and the cost of that for the company is so low that it is seen in fractions of a penny. Don’t waste your money on fries. Same goes for the soda, for the price of a small soda, you can buy a 2 liter bottle at the store. Testing Disqus Comments. Uh-oh, we’re out of special sauce! Time to put this mayonnaise in the sun! When that jingle for the burger first came out, they were supposed to cook those patties on the grill with rehydrated chopped onions they were supposed to be salted and peppered as well. That added a lot to the taste along with the special sauce which basically looked like thousand island dressing. I don’t think they used those old fashioned grills so I have no idea how they try to reproduce the original taste. It used to be quite good, when made as designed, but it looks as if they have sacrificed this for efficiency. Ah, you’re right. -1 again for the real life thing. I agree, those ‘wings’ at Wendys are just awful tasting. I’m surprised they have stayed on the menu this long! Hey I have a suggestion, I went to Wendy’s today and tried their boneless BBQ wings. I would try those, I was not impressed. let’s just say it was like chicken nuggets covered BBQ sauce. not at all like the picture and defintley not worth 3.99. I admit yours looks terrible while whatever Gary has is just inexcusable. I hope Gary got a refund. 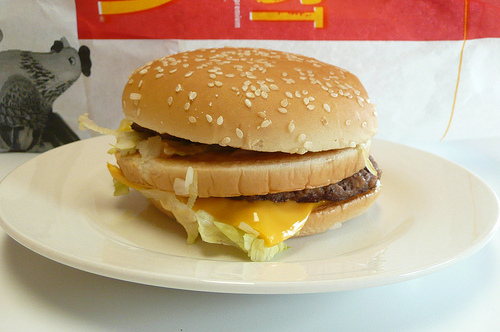 My Big Macs always look great and taste as they should. I will be sure to let the world know when I become the winner of a lousy Big Mac. I think I’d go with ice cold Becks-Beer. The real picture isn’t even close. False advertising. Yes definitely a red, maybe a bordeaux would be good. Actually, I can see a little of the sauce peeking out below the beef patties in the top picture. Yeah the Big Mac is the worst sandwich ever, now. 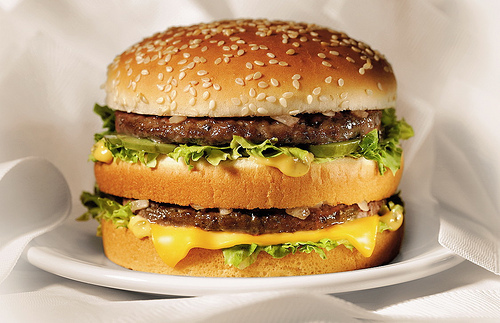 There is about 3 times as much bread on the big mac than the meat. The sauce is tasty, but it is lacking, after you finish one you wish it would have been better.